Second gamer Andre Gianfagna walked onto Etihad stadium on Sunday in the match between North Melbourne and Hawthorn with a camera strapped to his head. The broadcaster was looking for a different level of interaction with the play and asked if the umpires would agree to trialling the camera. If you watched any of the vision you would have to agree that an umpire’s head is constantly on a swivel and he has many many things to consider before awarding a free kick. I trust that the viewers didn’t get a little sick watching the game with the camera jerking around. The technology has changed significantly if you look at what Andre was wearing and then rewind to the Hall of Fame game in 2009 and see what Jason Venkataya was wearing. Perhaps as the swans supporter suggested to our umpires in the Sydney v Adelaide match, a pair of glasses would suffice? 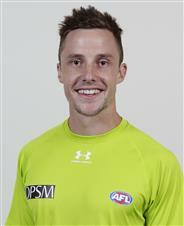 Congratulations to Nick Foot who became the 362nd umpire to officiate in 100 VFL/AFL matches. He is the 90th field umpire to achieve the milestone. Nick, who hails from Tasmania, is starting to close in on former field umpire and Tasmanian Stefan Grun’s games tally of 107. He still has a long long way to go to catch our other Tasmanians, Mitch Lefevre (233 games) and Tasmanian Team of the Century umpire, Scott Jeffery (324 games). The drawn match between St.Kilda and GWS was the fifth time field umpire Shane McInerney had officiated in a drawn game. It was the fourth for Mitch Lefevre and the second for Brent Wallace, Jordan Andrews and Shaun Apted. Boundary and goal umpires are usually state based and rarely travel. Over the first few rounds our Brisbane based umpires have travelled every other week because of the Gold Coast scenario with their ground out of action until later in the season. However, with reduced listed due to injury others have had some travel. Veteran boundary umpire, Ian Burrows umpired two games in round 5. The first in Sydney on Friday night and he backed up again on Tuesday night at the MCG. 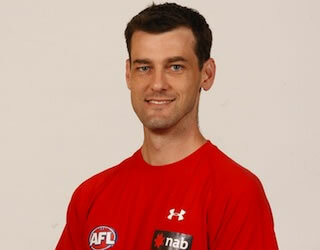 Queensland boundary umpire, Peter Bock was in for his first game of the season following his return from overseas as the schoolboys cross country national coach. Peter spent a couple of weeks in the UK with the team. He was back in time for the Queensland derby or Q clash as it is called. Michael Marantelli became the 17th umpire in the history of the game to have now officiated at least one game on every day of the week. He umpired the Richmond v Melbourne game at the G on Tuesday night. Can you believe the stats that are kept by our statistician historian, David Flegg?